The City of Prineville is reaching out and looking for artists in the Pacific Northwest interested in creating artwork that will serve as the centerpiece of the Tom McCall/Highway 126 roundabout and as the gateway to the community. The municipality is accepting a Request for Proposal from artists living in Oregon, Washington or Idaho through March 5. Project details and submission guidelines can be found at bit.ly/PrinevilleRoundabout. "We just decided that we have a lot of great artists here in the Pacific Northwest, so why not give them a shot at it," said City Engineer Eric Klann, one of several city staff spearheading the artwork effort. Work has been ongoing for about a year to fill the void inside the roundabout, which is nothing more than a mound of dirt at this point. Klann notes that a recently formed focus group has met a handful of times in the past few months and conducted three public surveys to gauge what type of artwork locals would like to see in the roundabout. Most people have urged city officials to consider something that pays homage to Crook County's history, culture and interest in use of natural resources. Early on, focus group members talked about highlighting the community's history in ranching, mining and logging, but they later realized that trying to artistically represent that many activities would make an overly busy display. Instead, the group will try to go with a single piece of artwork, possibly but not necessarily made of bronze, that will appeal to the majority of the public. Whatever the artists come up with will need to meet certain ODOT guidelines regarding height and other restrictions. City Planning Director Josh Smith points out that the feature needs to be tall enough to obstruct passenger car views, but short enough that truck drivers can see over the top and anticipate traffic. Klann added that the artwork cannot feature any moving features, and no statues paying homage to a specific person are allowed. 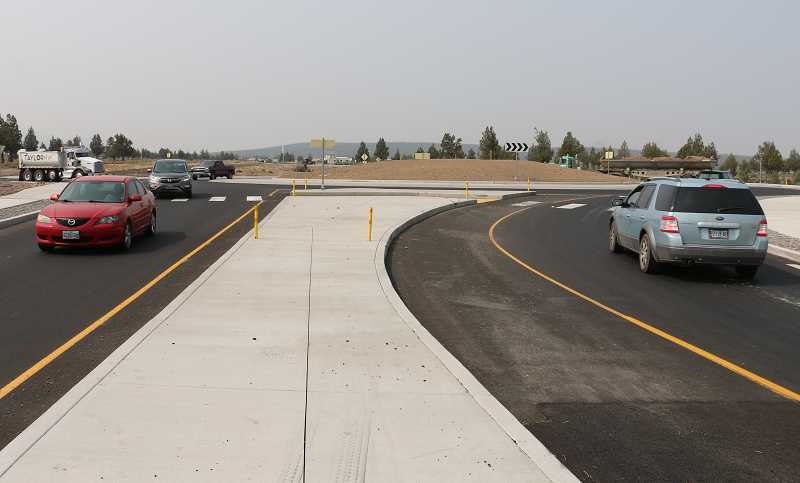 No public dollars are slated for Prineville's roundabout art initiative, so estimated $125,000 necessary to fund the project will likely come from private donations. "We are currently gathering funding for this," Klann said. "We estimate that more than likely the community will be able to get to that $125,000 number." Plans to follow the March 5 deadline are not fully defined at this point, but Klann envisions the focus committee looking over what he hopes is a plentiful list of proposals and narrowing it down to a few top choices. The Prineville City Council would then review those choices and perhaps narrow the field to three before presenting options to the public for their input. "The Tom McCall Roundabout Art Design is an exciting opportunity to celebrate our unique, high desert community," said Prineville Mayor Steve Uffelman. "We're looking for a regional artist who can take inspiration from the community's recreational opportunities, natural beauty, and cultural heritage to create a well-integrated, visual focal point worthy of this special place."